I’ve been experiencing problems with my phone line and DSL connection for quite a few months now. However, the problem was always intermittent. I would experience static on my phone line and DSL loss of signal errors at random, non-reproducible intervals. I just couldn’t figure out what was going on. So, I finally called AT&T and asked them to check it out. They sent a service technician and, as I expected, the line was clean while he was here. However, 2-3 hours later, the phone line started acting up again and the 2Wire HomePortal was bathed in red lights again. Oh well, that repair didn’t work. A few days later, AT&T calls back to ask how they did. 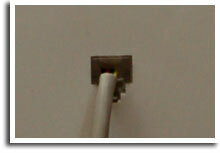 I told them that the technician could not fix the problem because the line was clean when he showed up. And, I didn’t give it much thought after that. But, lo and behold, a few days later, someone from AT&T calls me back and asks if they can send another technician out to troubleshoot my connection. Well, this second guy fixed the problem.Almost a week has passed and the DSL connection has been rock solid. No static on the phone line either. So, the technician tells me that I shouldn’t have the data line routed to all my phone jacks. Said that was fine for older houses with a limited number of jacks. However, for newer houses with 8-10 jacks, wiring the data to all phone jacks will weaken the data signal and cause interference. I don’t know if his explanation was technically right or not, but his fix of converting one phone jack to become a dedicated data line sure worked. the staff at the phone store, very rude and uneducated in their field, i will try to get out of my contract. It is the worst internet service they are not educated in there field they will not put uverse in our complex and they will not fix our internet. They do give u the run around and they blame everything on your equipment and the building and not on there own equipment and network. All they do is lie about everything that they tell you and they said that they would shut my internet service off because I complained about my internet service and telling them to put uverse in. We were told by the one field mananger that they will put uverse in where they want to.